Sadly, another long-time Who alum has left us. 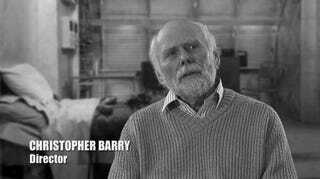 Christopher Barry, who directed 43 episodes of the program between 1963 and 1979, from the very first Dalek serial through Tom Baker's encounter with the Creature from the Pit, died this morning after a fall in his home, age 88. Barry was a regular contributor to the special features on the classic series' DVD range, often talking about the trials and tribulations of creating memorable science fiction on a shoestring budget. In addition to working with four different incarnations of the Doctor, he also held the dubious honor of putting on a silly hat and portraying one of the previous incarnations of the villainous Time Lord Morbius (or possibly the Doctor, depending on who you speak to) during the mind-bending sequence in The Brain of Morbius, which he also directed.